Crete food is characterized by the unique virgin oil from olive trees that exists in every meal. Professor Kafatos goes on to recommend a return to the traditional Cretan eating habits, but with a noticeable decrease in the amount and frequency of meat and other animal products. The consumption of olive oil must be continued; it has been proven through several studies that this excellent oil plays an all-important role in warding off illnesses and in preserving good health. Olive oil also contains a vast amount of anti-oxidative agents which provide protection against such conditions as arteriosclerosis and some forms of cancer. We are also told that the composition of olive oil in fatty acids is similar to that of mother’s milk. A Cretan consumes 34.6 litres of olive oil annually, an American 11.3 L, against an Australian 1.2 L.
A Cretan gets nearly all his food from nature, eating an abundance of fruit and vegetables. The only fat content in his food and salads is olive oil. Every day, all the family, and their guests, sit around the table, and talk about their daily problems, whilst enjoying one another’s companionship. On Crete, in ancient times, meat was eaten as a part of rituals when sacrifices were made. At a later period, the days of celebration were the days for the eating of meat, and it was only much later that it became a custom for it to be eaten every Sunday, or every other Sunday. According to the historian Paul Faure, the peasants and the people working in the palaces had frugal vegetarian meals. They were paid in grains (wheat or barley), dried figs, and olives in brine. A little goat, beef or pork meat was consumed only on feast days. Their religion also forbade certain foods for one third of the year. The orthodox church banned the eating of meat, and in general, any food which came from animals, for long periods of time: 40 days before Christmas, seven weeks before Easter, 15 days before the celebration of the Assumption, on the 15th August, and every Wednesday and Friday during the year. The Cretans eat three times more bread than the average American. In the past this was always wholemeal, or black bread, made primarily from barley, rye or wheat. Fish was the basis of most Sunday meals and was eaten more in the coastal areas than in the hinterland. The Cretans eat more fruit than anyone else, twice as much as the Americans, and six times as much as the Dutch. Their grapes ,figs, apricots, pears, and peaches, are renowned for their delicious flavour. Pulses are eaten every two or three days, whilst vegetables and local greens are a staple at every meal.One or two glasses of home-made wine are consumed with each meal. Along with the fruit, much of their vegetable intake was, and still is, uncooked. This includes spinach, chicory, artichokes, and large amounts of vetchling (sweet peas) along with purslane, tomatoes, and cucumbers. These are all eaten with large amounts of olive oil. The Cretan stafidolia (wrinkled olive) is considered a priceless treasure. When farmers go to harvest the olives, they merely take a piece of bread with them.They eat some of the olives that they have collected, still in their natural state without having been treated, with the bread they have brought with them. These olives are a totally natural product, and need no salt or other chemical substances to take away their bitterness, as the olives lose their bitterness on the trees. Milatos has a lot of taverns all by seaside and it is famous for that . You can eat and hear the noise from the waves that hit almost your legs . Worth visiting taverns are “Akrogiali” , “Seirines”, “Xatzis” “Meltemi” and “Meraklis” . 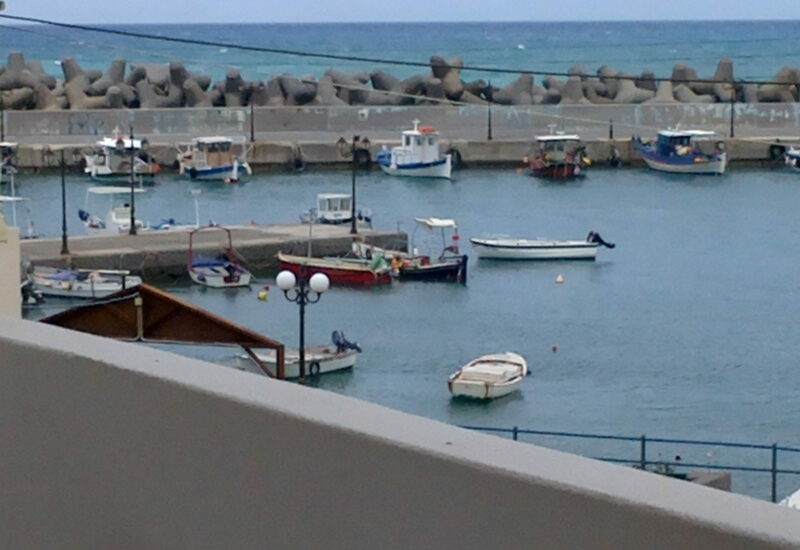 Don’t miss fish food and specially “rofos kakavia” that is a special fish fished at Crete sea cooked as a soup with carrots, potatoes, marrows ,onions and tomatoe . Allthough a little expensive , don’t miss it. It is worthless if you come to Milatos and not taste “Hohlious mpoumpouristous ” or “hohlious giahni” that you can find at Latsida a nearby village that has that tavern .They are Crete snails that are cooked on the pan with vinegar and rosemary or cooked in marmite with tomato and marrots . Also worth tasting the “souvlaki” and “aiga kokinisti” that is goat cooked with tomato. Another worth visiting village famous for its food is Kroustas near to Kritsa and Agios Nikolaos that you can find at its tavern “aiga vrasti” with “skioyfihta makaronia” that is goat boiled with local made spaggheti. Combine one day tour and visit Anogia (otherwise a worth visiting place for its history ) and taste “arni antikristo” that is lamb cooked opposite to fire. Also worth visiting Zaros famous for its lake and try trout broiled over charcoal at “Votomos” tavern .